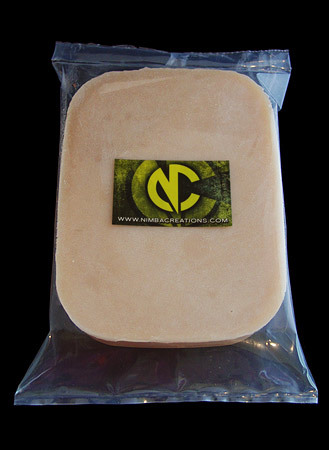 This prosthetic gelatine 1kg block is the same as we use in the creation of our prosthetics. Simply melt gently in a microwave or in a cooking pot and pour into your own moulds to create professional prosthetics. Bad castings can be re-melted and used again. A very versatile material. Also available in 200g blocks and 400g blocks for smaller castings. Read our 6 Tips for Using Gelatine to Make Prosthetics in our blog post. INSTRUCTIONS; If being used for direct application, test on small area of skin before use; if any adverse reaction occurs, discontinue use. When melted, always test temperature of gelatine before using on skin. Do not boil. Protective clothing should be worn when handling hot gelatine. Keep out of reach of children. Avoid eye and mouth areas. External use only. Easy to use and realistic. Nimba gelatine is my number one product that I use. It simulates real skin and blends in very well when used with blender.